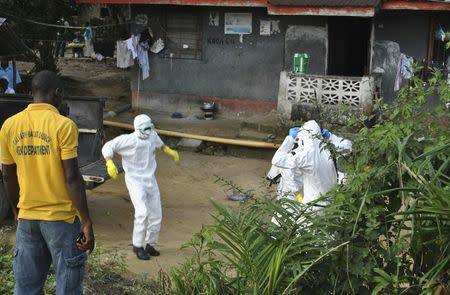 DAKAR (Reuters) - Sierra Leone appealed to the United States on Wednesday to send military aid to help it battle Ebola as it falls behind its West African neighbours Guinea and Liberia in the fight against the virus. Guinea's President Alpha Condé said on Wednesday he is ready to authorize anyone who refuses to let doctors check Ebola suspects for signs of the disease. Britain, the former colonial power, has sent military personnel to establish treatment centres in Sierra Leone, as well as three helicopters and a 100-bed naval hospital. Sierra Leone's President Ernest Bai Koroma has introduced emergency Ebola measures. He said it might be necessary to call another three-day lockdown to remove the sick from communities and transfer them to newly built treatment centres. The European Union announced in Monrovia on Wednesday it would disburse 22 million euros of budget support to help Liberia scale up its efforts to eradicate the virus.